So far we've had furious and predictable reactions to our Financial Secrecy Index (FSI) from Jersey and Luxembourg, in each case based on a simple failure to read or understand the material clearly displayed on our website. Now it's Cayman's turn to do exactly the same thing, courtesy of (among others) a colourful character called Jack Irvine. It's worth taking a quick look at Cayman's response to the FSI. It is important to note from the outset that this peculiar outburst - nearly as bizarre as some of Cayman's earlier outbursts - did not even respond to the evidence of Cayman's secrecy - but instead engaged in three other main areas. First, they railed against high taxes, claiming TJN to be "high-tax zealots." (We are not high-tax zealots: our core principles are founded on an idea that distortions in tax systems -- created by, among others, tax havens -- are a bad thing.) OK, one can have endless argument about tax rates, but the Financial Secrecy Index is about secrecy, not tax. Their second angle was that - as with all the other tax havens - they have been 'white listed' by the OECD and others, and that therefore we must be wrong. What they did not point out was our analysis that these white lists are not worth the paper they are printed on. The evidence in support of this position is overwhelming, and the deeply researched Financial Secrecy Index underlines it. Their third angle of attack was the same old tax haven tactic we have seen year after year: if you can't deal with the arguments and the message, then attack the messenger. And here they went off the rails completely. Look at this. This is laughable on so many levels. First, it is not a crime or even a misdemeanour to have a modest house, as Murphy himself notes with his usual caustic humour. Second, it is nonsense to say that "he would like all countries to have a common tax system." Third, Murphy, for all his valuable input, does not run TJN. He is a senior adviser to TJN, and an influential one, but if anybody 'runs' the Tax Justice Network it is John Christensen, its director and founder. And this leads on to a fourth point, and a little story. It concerns Jack Irvine, media adviser to Cayman Finance. A rather right-wing figure who has been described as a "Rottweiler of Glasgow Journalism", Irvine has apparently been known to rail against gay men as "slobbering queers" and has a record of publicly defending questionable characters but was nevertheless retained by Cayman in to burnish its image. In 2009 Irvine engaged in a dedicated effort to attack TJN's reputation, in which he contacted people and highlighted (among other things) the picture on page four of this document. 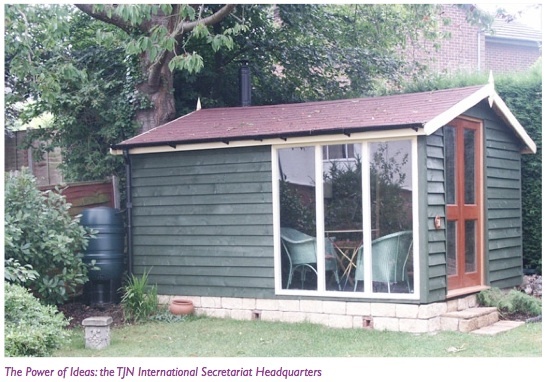 "The Power of Ideas: the TJN International Secretariat Headquarters." Now back to the caption under that photo, and The Power of Ideas. We don't have a lot of money, but we do have ideas. In the Cayman Islands, it seems to be the other way around. 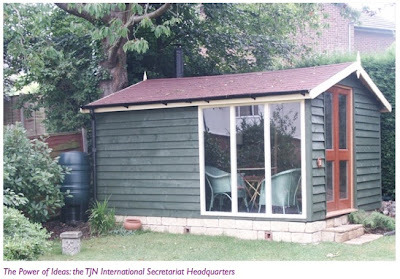 The Power of Ideas: the TJN International Secretariat Headquarters. though this Apple-using TJN blogger is sad today about the death of Steve Jobs.